It seems the view I see most often these days is the screen of my laptop. Sometimes there’s not..I can’t decide which I like better, so I decided to share both. 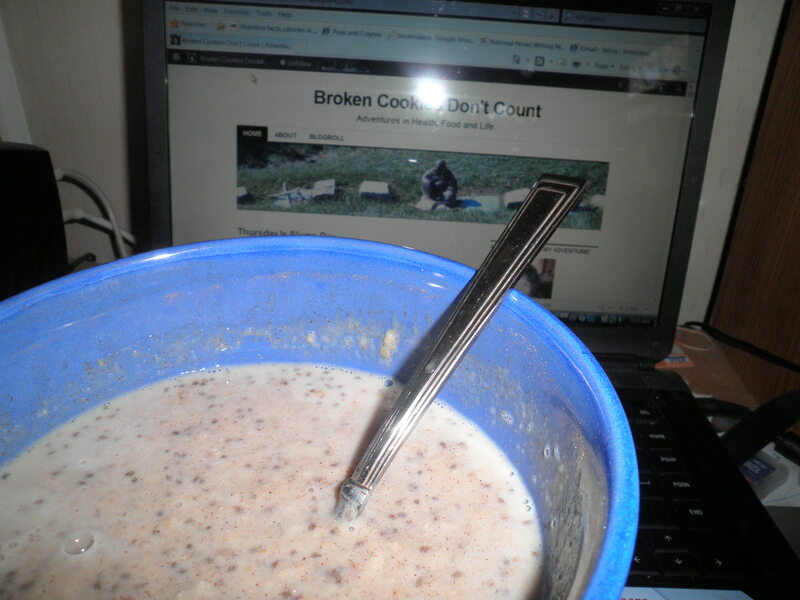 This was my attempt at creatively showing you my oatmeal from Friday morning. 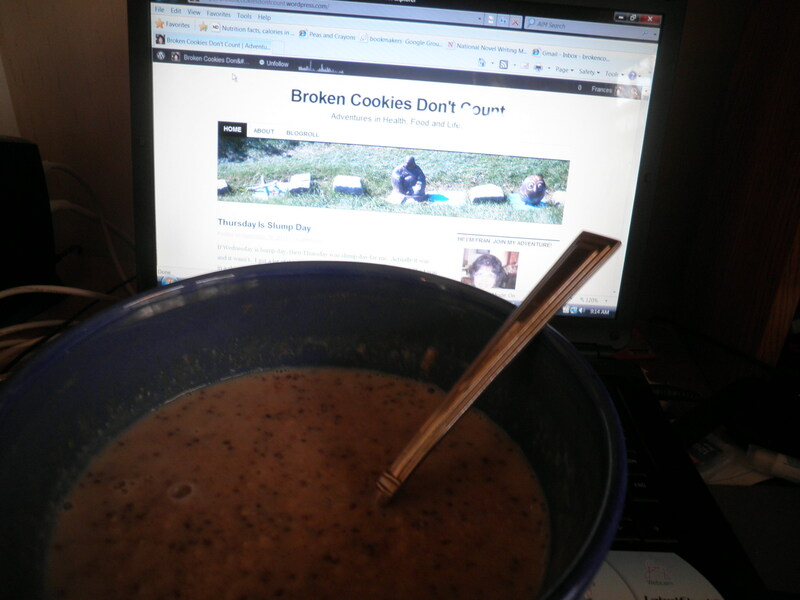 I’m not quite sure why my bowls of oatmeal or oatbran never looks as appetizing as the bowls on other blogs. Maybe because they cook theirs stove top style and I’m a microwave kind of girl. Maybe because they have more space to set up their shots. Maybe they have better cameras. All of these things could be true. Or it could just be that they’ve been doing it longer. I don’t know. Doesn’t it matter the most how it tasted after all? I think that’s what counts. My oatmeal tasted Yummy! It was a mix of 1/2 cup of oats, 1 1/4 cups of water, 1/2 a pack of Weight Watchers French vanilla smoothie mix and lots of cinnamon. Microwaved for three minutes and then 1/2 cup of soymilk and 3 packets of Splenda. It was warm and tasty and kept me working, which was what I needed it to do. 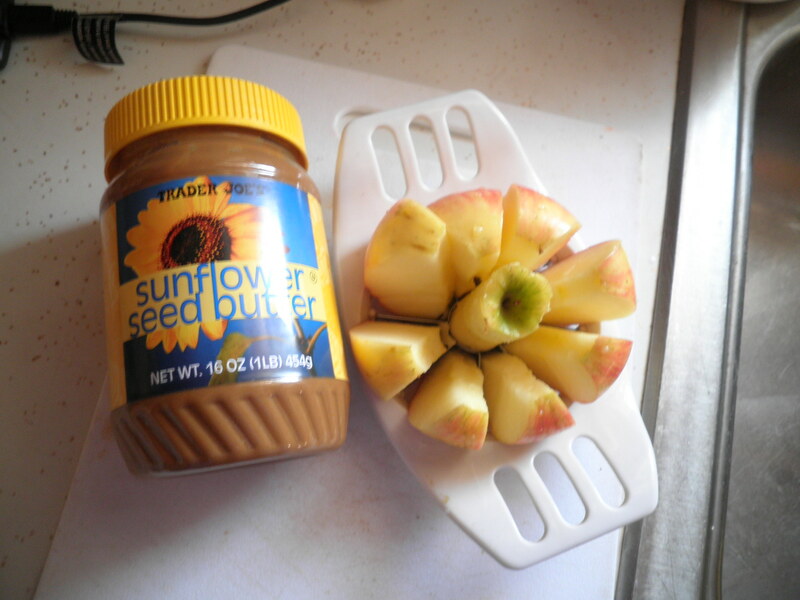 Sunflower seed butter and honeycrisp apple. Such a good combo. I’ve eaten so much of the sunflower butter that soon I will be faced with the joy of overnight oats in a sunflower seed butter jar. I’m really looking forward to that. Only problem will be that then I need to find more sunflower seed butter that I can’t seem to find around here. I guess a pilgrimage to Trader Joe’s will be in order! Saturday morning found me at Weight Watchers of course. The WW stars were shining on me today. In spite of eating out 4 times this week to celebrate 2 different birthdays I was able to stay the same. I really had no idea when I walked in what the result would be. I was most grateful and will work harder this week. Now that I’m doing so well with my word count for NaNoWriMo, maybe I can fit some exercise in this week. That’s my plan. After WW, of course Gail, Alice and I headed to breakfast at the Gateway Diner. 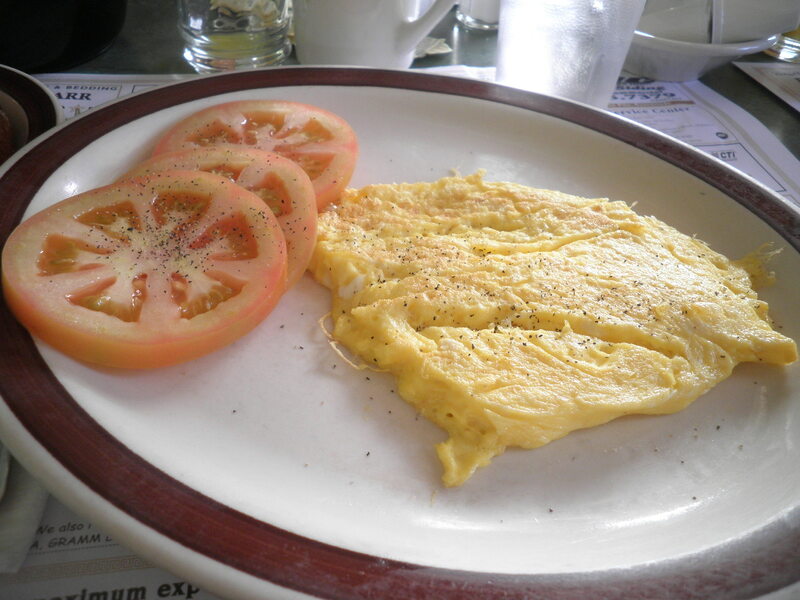 I ordered my usual, scrambled eggs with sliced tomatoes. I’m going to try to get even further ahead on my writing today. I have 11 days left until I need to finish, but it doesn’t hurt to get some extra words in. That way I won’t have to worry about doing it on Thanksgiving day if I don’t feel like it. 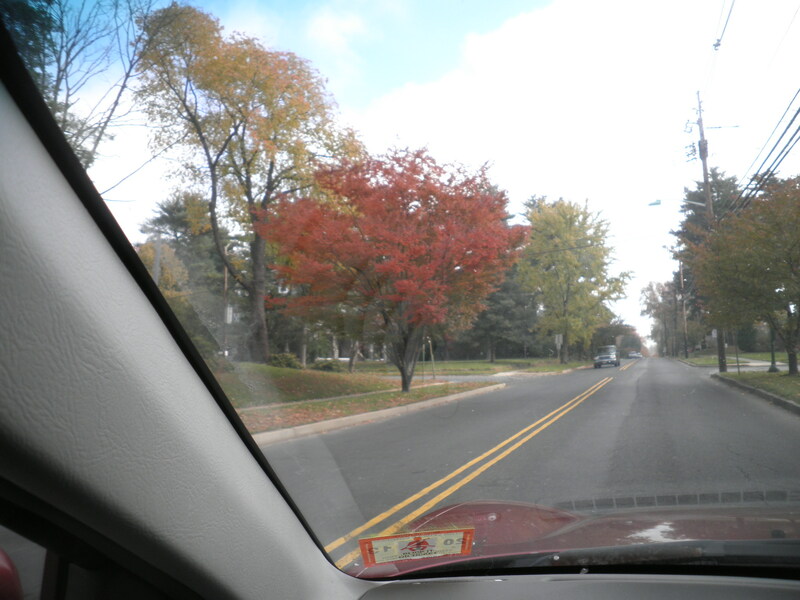 Thought I’d leave you with a few more Fall pictures. 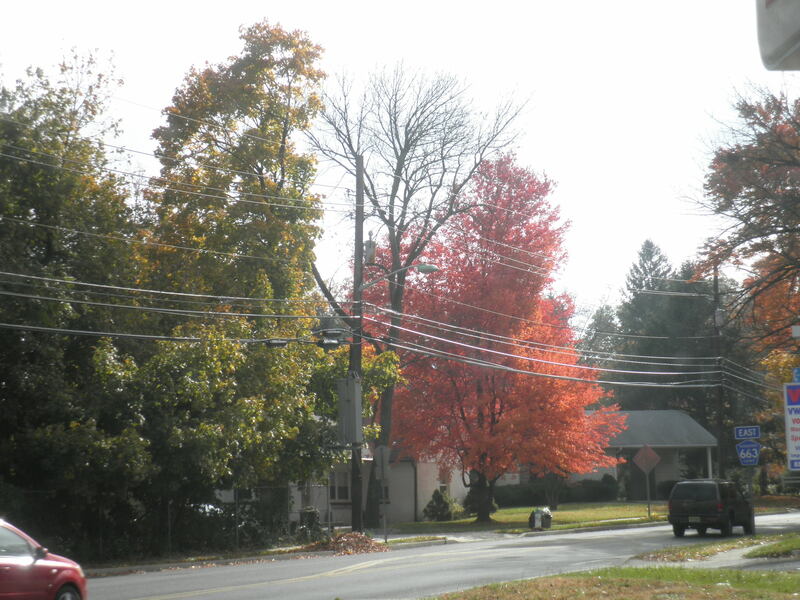 Most of the leaves are gone now, but you do find a tree here and there with some color left. These are from last week. This entry was posted in Uncategorized and tagged nut butter, oatmeal, Weight Watchers. Bookmark the permalink. Congratulations on the word count – would love to read some of it one day! Thanks for not sharing my secret! I gave it a bit of a rest today on the writing. I didn’t even calcualte. I think it’s probably about 500 but I plan to get more work tomorrow. Just needed to take a little time off. Not sure where I’m going with it, but I appreciate that you’d be willing to read it. Have a great weekend! Thanks,Val! Remember, it’s quantity over quality! About the third of the way through, I added a new character and he kind of took over. I sort of left the other characters twisting in the wind. I could all even out in the revisions. Whether it will ever see the light of day, I don’t know, but I’ve sure learned alot that I can use for the next one! Now I just need an idea! I actually just had that sunflower butter (okay, not yours, but you get the idea) and a honeycrisp apple (all from TJs) with my dinner tonight. I even used my apple wedger thingy….AND I had oatmeal for breakfast this morning! But, since I’m not participating in NaNoWriMo, that’s where the similarity ends…. I’ve never heard of sunflower seed butter, but now you have me interested. I’m so happy about you reaching the NaNoWriMo deadline. You’re almost in the home stretch. I’m cheering for you. Love the pictures. Marie, I had never tried the sunflower butter until about a month or so ago. The brand I got tastes just like sunflower seeds to me. I love it. Thanks so much for your supporton my Nano efforts. I appreciate it. Glad you like the photos!